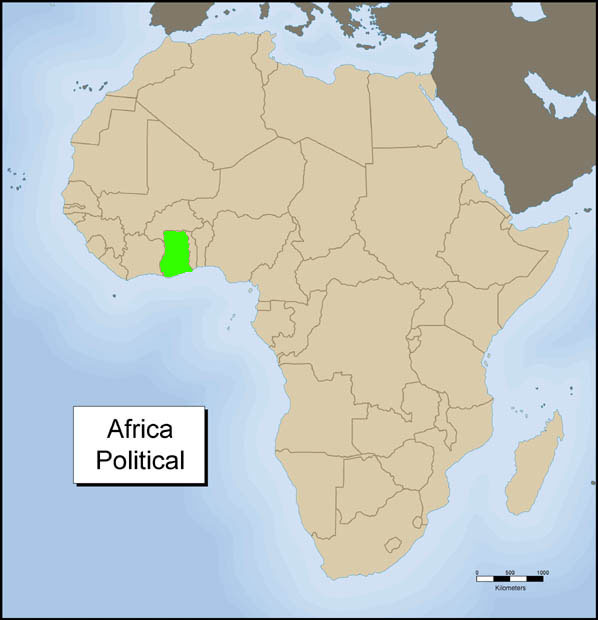 Introduction: Ghana is located in west Africa, on what was formerly known as the Gold Coast (click here to see a map). Ghana has a complex history and many different languages and cultures coexist in this diverse country. Beginning about 1500, numerous states rose to power, known as the Akan kingdoms. While there are many Akan states, the most historically powerful and well-known is the Asante kingdom, whose leaders have been a dominant force in West Africa since the seventeenth century until British colonial forces defeated them in 1896. The paramount chief, the Asantehene, of the Asante confederacy continues to be an important cultural figure and patron of the arts. While he still has political power, it has been superseded by the democratically elected leaders of Ghana. As it did in the past, the royal court commissions artists to create elaborate regalia, palaces, furniture, sculpture, sumptuous fabrics and shrine objects. One of the key features of Asante visual art is its complex symbolic connection to verbal arts. That is, the graphic decorations, symbols and figural compositions are always directly related to proverbs, traditional sayings, or historical events. Thus, a person well versed in Asante history and proverbs, can ‘read’ the specific meanings represented in art objects. Because the most significant patrons are the royal courts, most of the symbolic meanings of Akan art are elaborations on good governmentship and philosophical commentaries on the necessity of wisdom in political and social situations. Asante artworks celebrate the power and prestige of the Asante confederacy and ensure that Kumasi (the capital of the Asante kingdom) continues to be a thriving center of artistic creativity. The work of Asante artists have gained an international reputation. While their work inspires pride and a sense of history among many people in Ghana, in the United States Asante artworks have become important to African American heritage and celebrations of multiculturalism. The Asante strip woven cloth called kente is unquestionably the most popular and best known of all African textiles. It is produced in greater quantity, exported to more places, and incorporated into a greater variety of forms than any other African art form. Originally kente was exclusively worn by royalty since at least the eighteenth century. The names and meanings of kente designs can allude to proverbs, historical events, social status, and the gender of the wearer. Each Asante king would create a new kente design after close consultation with master weavers during his reign. This new kente design had to be chosen with great care because its pattern and symbolic meaning would always be associated with this particular king. Since Ghana’s independence from Britain in 1960, kente has become a symbol of national pride and ordinary citizens wear it for special celebrations. Kente cloth has also become an important symbol for African Americans to highlight their connection to the African continent. Kente has figured prominently in celebrations of African American heritage, such as Black History Month. Many Americans wear it to show their awareness or support of “Black Pride.” Thus the United States and other parts of the world are today central to the African art market and the livelihood of artists in Ghana. You will be introduced to the meanings and traditions associated with kente cloth. You will also be asked to make your own kente patterns to gain an awareness of abstract design principles. You will be asked to look for examples of kente cloth in America and be made aware how kente cloth is important to American culture. While looking at images of kente cloth (figure 1-4) and Asante kings wearing it (figure 5-7), answer the questions below. 1. Observe the details of the patterns closely. Can you tell how the cloth has been sewn together? 2. How are the checkerboard patterns created? 3. Each cloth is given a different name that is determined by the pattern of the individual strips. Look carefully, notice that at first glance the cloths look very similar. But if you look at each individual pattern, notice that none are the same. There are over 1,000 specific kente patterns, all with different names, and new ones are being designed all the time. What color seems to be repeated in each cloth? 3. Why do you think yellow is a color chosen for royalty? Look at the image of the Asante king (figure 4). What can you learn by looking at his clothes. What messages does clothing convey? Using your knowledge about Asante culture, what kind of observations can you make, just by looking at this king? Identify what country he comes from, what kingdom or people he is associated with? Give the rank of this person. Is he low status or high status? What is the occupation of the wearer? What are the wearer’s notions of style? Is this a ‘traditional’ outfit, or cutting edge fashion? Can you guess his political affiliations? Is he popular among his people? What is his body language like? Is he wearing kente cloth with pride? Why? 1. Now look at a photograph of a series of people in a magazine and apply the same questions to them. What do his or her clothes tell you about that person? 2. What do your choices in clothing say about you? Have you seen kente cloth here in America? Look at pictures related to the African American holiday of Kwanzaa. Kente has become a symbol of African American identity. Within the context of the Pan African Movement and the civil rights struggle, kente became a popular symbol of pride. Look at the color combination in figure 2, have you noticed these colors in the United States? In what context? When someone in America is wearing something with kente patterning, what are they saying about themselves? How has the meaning of kente changed from its African to its American context? Look at figure 3. This is a kente cloth created by Ewe peoples who also live in Ghana. This cloth is not associated with kingship. As among the Asante, Ewe artworks are linked with the verbal arts. Therefore, images are often directly linked to sayings, like proverbs, praise names, riddles, and even folk tales. Kente cloth usually has abstract patterns that are linked with sayings. But Ewe artists also incorporate recognizable motifs. Find the motifs in the cloth in figure 3 that best describe the proverbs below. Match each motif with its appropriate saying. 1. The world is like a _ _ _ _ _ _ _ _ _ ‘s skin, it changes. 2. When I lock it, no one can open it. I am a _ _ _. 3. The _ _ _ _ _ _ _ says to be afraid is to live. 4. I have two sharp edges. I am a _ _ _ _ _ _. 5. A _ _ _ _ that grows feathers will always fly. Now that you know the symbolic significance of kente patterns, design your own pattern. Using a sheet of graph paper, carefully think what symbolic meaning you would want your design to have. What colors would you chose? What meaning can you attach to your choices? What name would your pattern have? What does your pattern tell about your history?